As environmental and outdoor science educators, we have a unique opportunity to engage youth meaningfully with nature. With this, we think, comes a responsibility to examine our own relationship to the land we live and teach on, to learn about the relationship the local indigenous communities had and have with the land. We can also engage our students in this conversation, guiding them to reflect as they develop a relationship with the land. 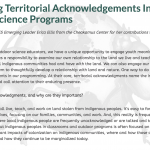 One way to do this is to include territorial acknowledgments in our programming. 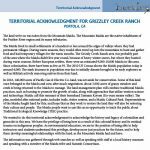 At their core, territorial acknowledgments name the indigenous peoples who first lived on the land and call attention to their enduring presence. For more information, check out the additional resources on this page.